Saddled with the burden of replacing one of baseball's legendary players, Carl Yastrzemski carved out his own iconic Hall of Fame career, eventually escaping Ted Williams' extraordinary shadow enough to win 3 batting titles and 7 Gold Gloves, and earn 18 All-Star selections. In Boston, where he played the entirety of his 23-year career, he is remembered especially for his Triple Crown season that led Boston to its Impossible Dream in 1967. Born August 22, 1939, in nearby Southampton, New York, Carl Michael Yastrzemski came of age in Bridgehampton, Long Island (population 3,000) where he often played alongside his father in local semi-pro games. Father Karol Yastrzemski (the name was Anglicized to Carl) and Yaz's uncle Tommy owned an inherited 70-acre potato farm, their work a "legacy from Poland, folks coming over here and doing what they knew from the old country." Before Carl was born, Carl Yastrzemski Sr. actually formed a semipro baseball team, the Bridgehampton White Eagles; he played shortstop and managed the team. It was almost entirely a family team, with Carl Sr.'s four brothers on the team, as well as two brothers-in-law and three cousins. The team played on Sundays, and did so for years. By the time Carl himself was seven, he was the team's batboy, his first "job" in baseball. He first played for the team at age 14 - young for a semipro player. Even at age 40, Carl's father was still "the guts of the ball club, a good shortstop and the best hitter of the team." His father played with drive and determination, but channeled his ambitions to play baseball into his son Carl. Still playing (and out-hitting his son) at age 41, Carl's dad was doing it for his son. Yaz attracted a lot of attention playing ball on Long Island. His last couple of years in high school, he played semipro ball for Lake Ronkonkoma, a team based about 60 miles from home. His father played for this team, too, always after work on the farm was done. It was around this time that Carl's father began to boost him as a hitter more than as a pitcher - oddly enough, Carl learned this at a major league tryout camp for the Braves, where Carl faced nine batters and struck out all nine. The younger Yaz had the chance to sign on with a major league team before he even got out of high school, but Carl's dad had his eyes set on a sizable bonus and was prepared to turn down offers he saw as inadequate. Come his senior year, Carl's dad told his high school coach that Carl would not be playing football that year - there was too great a risk of injury, and that might hamper his development as a baseball player. Red Sox scout Frank "Bots" Nekola had had his eye on Carl since he was a sophomore in high school. He never threw any pencils in the Yastrzemski household, but he wasn't coming up with $100,000, either, and so Carl's father sent his son off to college. They'd fielded full scholarship offers from a number of colleges, but chose Notre Dame, playing on a scholarship that was half baseball and half basketball. Yaz completed his freshman year, without playing on the varsity team, but then the offers got more serious, even exceeding $100,000. The Red Sox didn't make the largest offer, but the admiration of the local parish priest for Tom Yawkey counted for a lot, and Yaz's father wanted him playing for an East Coast team, not too far from home. Yaz signed with the Red Sox in November 1958 for a $108,000 bonus, and their agreement to cover the rest of his college education. The first of many spring training camps was 1959 and Carl was assigned to the Raleigh Caps in the Carolina League, a Class B team. The team switched him from shortstop to second base. He was struggling at the plate until manager Ken Deal got him in the box and told him to move up on the plate so he wasn't lunging at balls on the outer half of the plate. He says he batted close to .400 for the rest of the year. After Raleigh's season was over, he was invited to come to Fenway Park, not to play ball but to look in on the ball club. Ted Williams greeted him and told him, "Don't let them screw around with your swing. Ever." Yaz then went on to Minneapolis to join the Millers as they entered the American Association playoffs. The first time he faced Triple A pitching, and he went 7-for-18 in the six games it took to win the title. And then he traveled to Cuba to play the Havana Sugar Kings for the International League championship. Fidel Castro came to the ballpark, arriving by helicopter and landing near second base. The Sugar Kings won in the seventh game, but it was the last time (until the Baltimore Orioles played an exhibition game in 1999) that an American pro team played in Cuba. In 1960, Carl headed to Scottsdale so he could train with the big league ballclub. Carl lockered right next to Ted Williams, but Ted rarely spoke to him. The main thing Carl learned from 41-year-old Williams was how hard he prepared himself to play ball. The Red Sox had had Pete Runnels at second base (Runnels would win the batting title in 1960), so they sent Carl back to the minors for one more year, the purpose being to train Yaz to play left field and get ready to take over for Ted Williams, the expectation being that Williams would probably retire after the 1960 season. Yastrzemski batted .339 for Minneapolis, just missing out on the title by three points, and began to show some skill in the outfield, recording 18 assists. Ted Williams retired in 1960. Both the baton and the burden of replacing the great Williams was passed to Carl Michael Yastrzemski. Opening day 1961 was April 11, at Fenway Park, and there was Yastrzemski playing left field and batting fifth. Replacing Ted Williams in left field and in the hearts of Boston Red Sox fans was a Herculean task for any player, let alone a 20-year-old with two years of professional baseball experience. Ted Williams was a larger-than-life figure on and off the field, and had played for the Red Sox since 1939. Yaz singled to left his first time up, but ended the day 1-for-5. His first and second homers came in back-to-back games on May 9 and 10, but all in all, he struggled at the plate. When Yaz struggled, the Sox asked Ted to interrupt his fishing and come pay a visit. Williams complied, visited, and watched Yaz take extra batting practice. He told Yaz he had a great swing and to just go out and use it. Yaz batted .266 in his rookie year, with 11 homers and 80 RBIs, a good first year once he'd gotten back on track. There was no sophomore slump: Yastrzemski boosted his totals to .296, with 19 homers (and 43 doubles) and 94 RBIs. His third year, he made the All-Star team for the first time, and improved dramatically again, to win the American League batting championship with a .321 mark. He led the league in base hits, doubles, and walks. All the while, Yastrzemski was improving in left field, honing the solid defensive play that he is remembered for today. He continued to add to his totals, again making the All-Star team in 1965 and 1966. In 1965, he accomplished one of the rarest of hitting feats - Yaz hit for the cycle in the May 14 game, with an extra home run thrown in for good measure. Later that year, Yaz even faced Satchel Paige, who came back to pitch one last time at age 59. He threw three innings and gave up only one hit - to Carl Yastrzemski. Yaz's first six seasons in the major leagues had established him as one of the star players in the game. 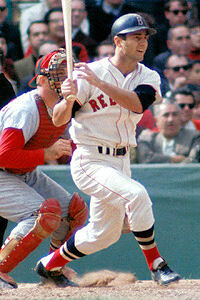 But his 1967 season would propel Carl Yastrzemski to a place among the elite players in the history of the game. By the time the 1967 All-Star Game rolled around, Yaz was among the top five in the American League in batting average, home runs, and runs batted in. The Red Sox were only six games out of first place at the All-Star break, and it was clear that the team had as good a shot at the American League pennant as anyone. The 1967 Red Sox held New England fans spellbound all summer and into the fall, as they battled for first place in the most exciting pennant race in American League history. Their thrilling win over the Minnesota Twins on the last day of the season touched off one of the great celebrations in Boston history. While a different Red Sox hero seemed to emerge daily, the one constant was Yaz. Former teammate George Scott remembers it this way, "Yaz hit 44 homers that year, and 43 of them meant something big for the team. It seemed like every time we needed a big play, the man stepped up and got it done." In the final 12 games of the season - crunch time - Carl Yastrzemski had 23 hits in 44 at-bats, driving in 16 runs and scoring 14. He hit 10 homers in his final 100 at-bats of 1967. He had 10 hits in his last 13 at-bats, and when it came to the last two games with the Twins, with the Sox needing to win both games to help avert a tie for the pennant, Yaz went 7-for-8 and drove in six runs. Yaz was no slouch in the playoffs, either, batting an even .400 (10-for-25) with three home runs and five RBIs in the World Series against the St. Louis Cardinals. The storybook season came to an end when the St. Louis Cardinals won the World Series in Game Seven, but Carl Yastrzemski's place was indelibly etched in baseball folklore. Yaz came within one vote of a unanimous selection as the Most Valuable Player of the American League. He was selected by Sports Illustrated as the "1967 Sportsman of the Year" at year-end. And he achieved baseball's "Triple Crown", leading the American League in batting (.326), runs batted in (121), and home runs (44). In all the baseball seasons that have followed, no other player has been able to match his Triple Crown feat. Yaz also led the league in hits (189), runs (112), total bases (360), and slugging percentage, not to mention on-base percentage. His On-Base plus Slugging (OPS) was 1.040. How did a Triple Crown winner who brought his team to the pennant miss the MVP by one vote? One voter cast his first-place ballot for Cesar Tovar of the Twins. Tovar batted .267, had six homers to Yaz's 44, and drove in 47 runs to Yaz's 121! The next year, 1968, Yaz won his third batting title, with a .301 mark. This was, for sure, the Year of the Pitcher, and Yaz was the only batter in the league to crack .300, a full 10 points ahead of the second-best Danny Cater. Only four batters hit .285 or above. Between 1965 and 1979, Yaz was named to 15 consecutive All-Star teams. The game he remembers best is the 1970 All-Star Game held in Riverfront Stadium in Cincinnati. Yaz had four hits, to go along with a run scored and a RBI to earn him MVP honors that year. He and Ted Williams  are the only two American Leaguers with four hits in an All-Star Game. Never one to focus on personal statistics, when asked about this record Yaz responded, "I never knew that before. To tell you the truth, I was so sick of losing to the National League that I didn't pay much attention to that stuff." It is sometimes written that Yaz had a "career year" in 1967, but never again approached that standard. It should be noted that in 1970 he led the American League in runs scored, on-base percentage, total bases, slugging average, and - when rounded - he was .0004 out of the lead for the batting title. When coupled with his all-time high of 23 stolen bases, you have a year that would have been a career year for almost any other player. Those 23 stolen bases made him only the second player in Red Sox history to steal more than 20 bases and hit more than 20 home runs in a single season. In February 1971, Carl Yastrzemski signed a three-year contract that was reported to pay him $500,000 over the three seasons. At that time his contract was the largest in baseball history. The year 1972 was a frustrating one. The season started late, due to struggles between players and owners. Teams agreed to simply play out the schedule without worrying whether one team played more games than another. As fate would have it, the Red Sox entered the final three games of the year playing the Tigers in Detroit. There was no chance of a playoff tie. The Tigers had a record of 84-69 going into the October 2 game, and the Red Sox were a marginally-better 84-68. Whichever team won two of the three games would win the pennant. The Tigers took a 1-0 lead in the first game, but Yaz doubled in the top of the third to tie it - and the Red Sox would have scored at least one more run (with Yaz safe at third with a triple) except that Luis Aparicio stumbled after rounding third and retreated to the bag where he met up with the oncoming Carl, who was called out. One never knows what might have been, but this was a pivotal play and the Red Sox lost the pennant by a half-game. Yaz had a subpar year in 1975, batting just .269 with 14 homers and 60 RBIs, but his play throughout the post-season reminded fans that he had always been at his best in clutch situations throughout his career. His stellar play in the field and at bat carried over from the American League Championship Series against Oakland (he was 5-for-11, with a home run and two RBIs) to the World Series against the Cincinnati Reds. Although the Red Sox lost to the Reds in seven games in one of the greatest World Series ever played, Yaz had scored 11 runs, and batted .350 during the 10 postseason games. As in 1967, the Red Sox fell just short. From 1976 to 1983, Carl Yastrzemski made the American League All-Star team six times. On July 14, 1977, he notched his 2,655th hit, moving past Ted Williams as the all-time Red Sox base hit leader. In 1979, he became the first American Leaguer to accumulate more than 400 homers (he reached the plateau on July 24) and over 3,000 lifetime hits (his September 12 single off New York's Jim Beattie was #3,000). Back on June 16, he'd banged out his 1,000th extra base hit. On October 1, 1983, the next-to-the-last game of the season, 33,491 of the Fenway Faithful gathered to pay tribute to Carl Yastrzemski. The pre-game ceremony lasted for about an hour, and then came Yaz's turn to speak. After 23 years of never flinching in a pressure situation, Yaz broke down and cried when he stepped to the microphone. Once he regained his composure, he asked for a moment of silence for his mother and for former Red Sox owner Tom Yawkey. After thanking his family and everyone connected with the Red Sox, he finished with the words, "New England, I love you." Carl Yastrzemski had played in 3,308 major league ballgames - the record until Pete Rose topped it the next year - and played for 23 years for one team: the Boston Red Sox. In January of 1989, in his first year of eligibility, Carl Yastrzemski was elected to Baseball's Hall of Fame. His vote total that year was among the highest recorded in the history of the Hall of Fame. On August 6, 1989, the Red Sox retired his uniform number and it still hangs today, #8, overlooking Fenway's outfield. At the home opener in 2005, Carl Yastrzemski and Johnny Pesky joined to raise the 2004 World Championship banner that has flown over Fenway throughout the 2005 season. Carl Michael Yastrzemski: the man we affectionately call Yaz.